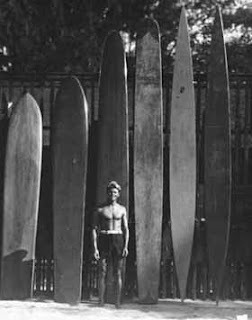 Bookride: Hawaiian Surfboard. Tom Blake. 1935. Tom Blake. HAWAIIAN SURFBOARD. Paradise of the Pacific Press, Hawaii, 1935. Early book by a legendary surfer (1902 - 1994) something of a disciple of the great Hawaiian surfer and Olympic swimming champion Duke Kahanamoku, he was the first person to surf the waves at Malibu and the originator of the surfing lifestyle and outlook. A spiritual man, influenced by Duke Kahanamoku's ancient beliefs he formulated a belief system that was based on the pantheistic idea of “Nature=God" he practiced this faith out-of-doors in what he called “The Blessed Church Of The Open Sky.” A recent authorised biography of Blake by his friend Gary Lynch has appeared 'The Uncommon Journey of a Pioneer Waterman' that seems pretty definitive. One review reads: 'If the sport's most influential waterman so much as whittled a breadfruit branch, it's in here. Co-author Gault-Williams painstakingly documented Lynch's words with over 700 footnotes, and the photographic inventory is of Smithsonian-style depth. This is an important book, and in many ways, a landmark. Ignore it at the peril of your heritage.' Chapters in the original book include "Riding the Breakers on this Hollow Hawaiian Surfboard." VALUE? No copies on the web although 'Hawaiian Surfriders 1935' a renamed reissue is around at circa $100. A copy in its original illustrated tapa cloth, a bit foxed, made $900 at Pacific Book Auctions in 1997, another copy made $2280 at Sotheby's last year with the cloth described as 'Kapa.' Copies, possibly an earlier issue, are known in plain cloth and d/w, the tapa cloth being slightly later but more attractive. A copy in a surf memorabilia auction in Hawaii recently was estimated beteen $3500 and $4500 so it appears to be a book on the move. I am not sure of the strength of surf books as a market, alot depends on the enthusiasm and affluence of the collectors, which is why golf books became valuable. Here in Santa Cruz (where I am currently typing this) surf is anyone's game, young, old, rich and broke - but you see some pretty fancy cars in the car park at Pleasure Point. I have a copy of this book.